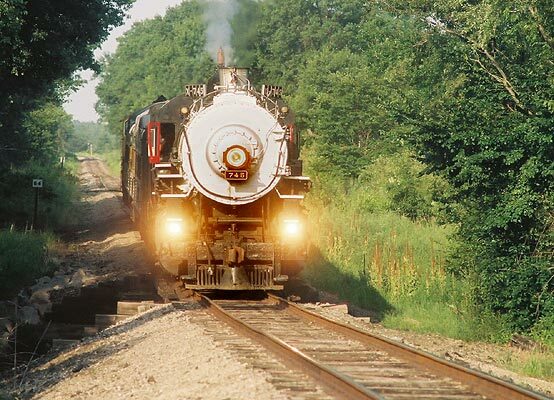 Friday, I posted photos and information on the Spirit of Louisiana, the Louisiana Steam Association's 1921 2-8-2 "Mikado" Mk-5 class steam locomotive #745 and its presence in the Pittsburg, Kansas, area for a few excursions. This past weekend I followed it...well, more precisely, kept getting ahead of it and shooting pictures. 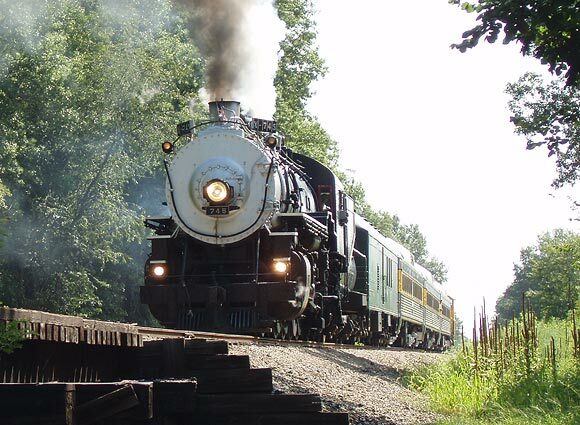 I rode aboard the train during one of its seven runs. 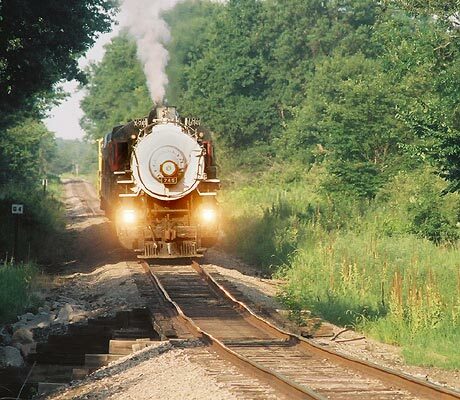 I can't seem to tear myself away from a steam engine. 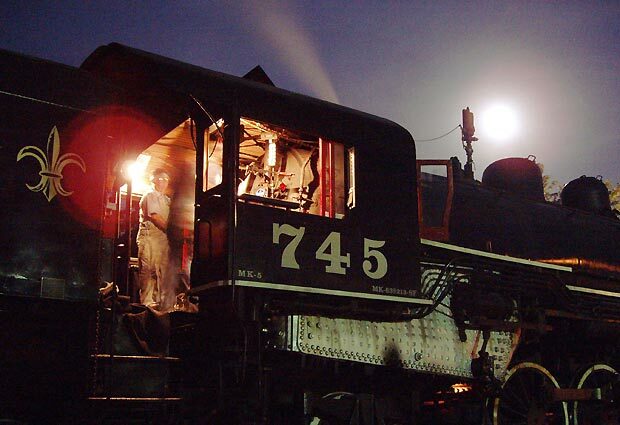 Members of the Heart of the Heartlands Railroad Club were instrumental in bringing 745 to Pittsburg, and they volunteered to help out on the train. 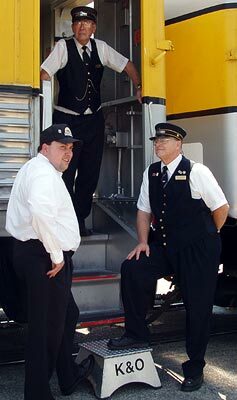 Many of them own their own vintage passenger railroad uniforms. 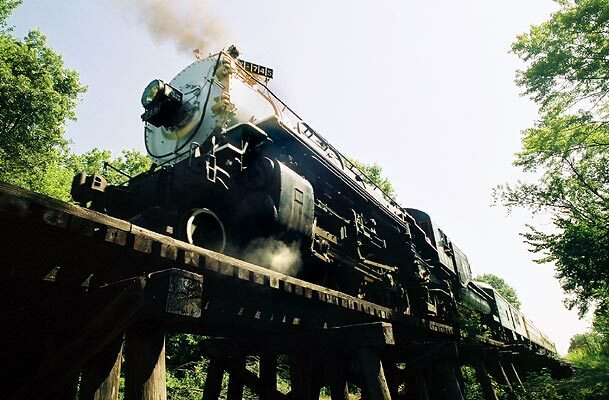 Joplin railfan, Jim Taylor, captured a "blow down" on film Saturday morning. 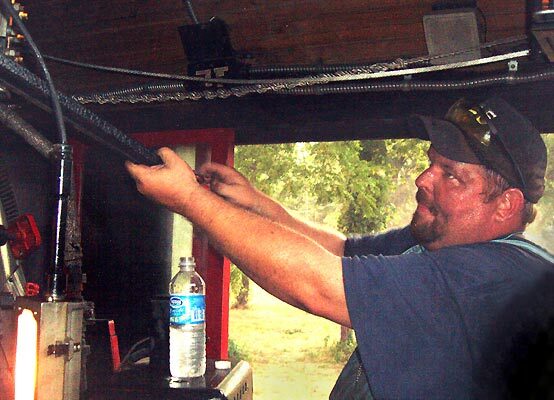 Before departure, the fireman uses this process to rid part of the locomotive of extra moisture. The water is hot, and exits as steam. 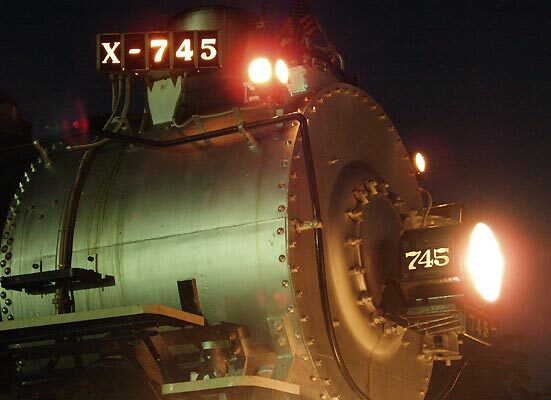 During one of 745's other departures, I shot this QuickTime movie; it's 31.8 MB but worth the download if you want to hear one of the locomotive's whistles (it has two) and see the busy box-like activity of the rods and wheels. You'll need a QuickTime program on your computer to see it; the free version will do just fine. If you don't already have it, here's a link to Apple's page where you can find a free download of QuickTime. If you played the video, you noticed the loudness of the whistle. It was fun to see people's varying reaction to it. In any group of a few people, there seemed to be someone holding their ears. 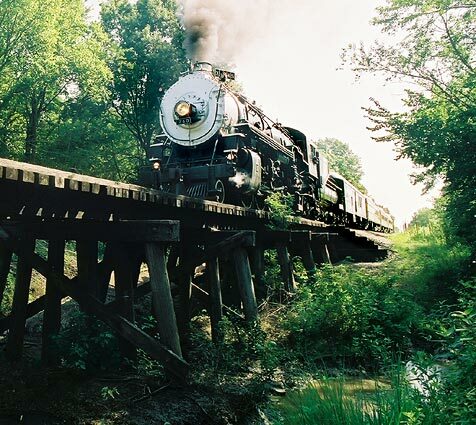 This is the trestle over Cow Creek, near the southern boundary of Pittsburg. This shot has the entire train, but also has power lines. I also shot a movie at this location; it's 18.7MB. 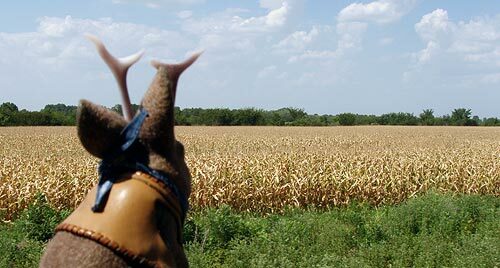 The scenery is a nice cross section of SE Kansas - fields, for the most part. 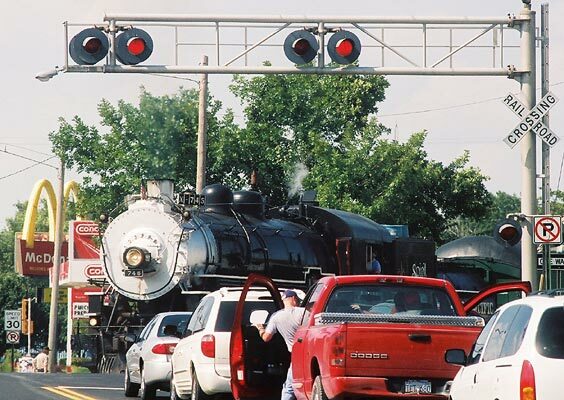 Many enthusiasts followed the train to more than one intersection. There were a couple of slight curves, during which passengers could see the engine. Passengers seemed to enjoy themselves. 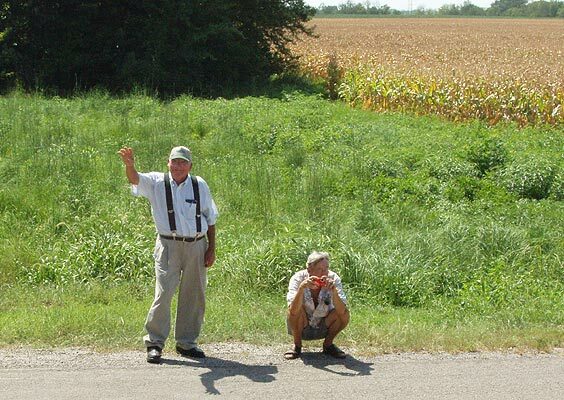 In addition to the ride, they also got narration from Larry Spahn, Heart of the Heartlands president. Something I like about 745 may seem odd, but I enjoy it's very "ordinaryness." 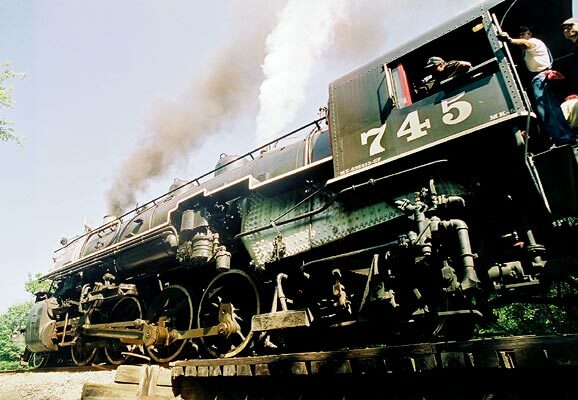 In its time, I am told, it was a relatively common type of working locomotive, not one of the big high-tech units like Union Pacific's 844, and that makes 745 a fine time capsule of day-to-day rail transportation in the mid 20th century. 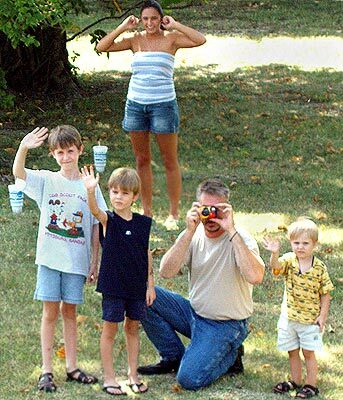 There is a great pleasure in seeing other enthusiasts, be they railfans or casual observers. I stayed on a vestibule at the rear of the train for most of my ride, and was mesmerized by this view. 745 passes a mineral plant. 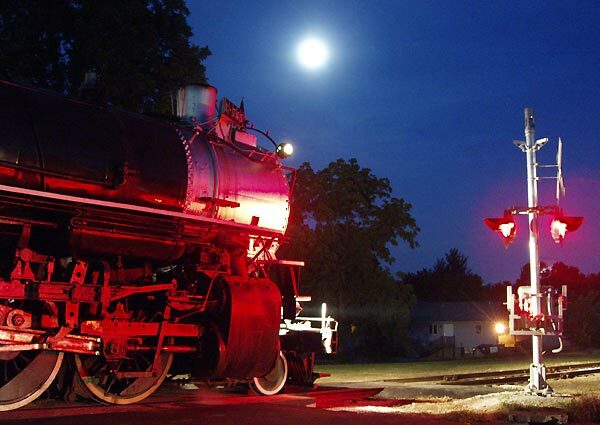 Mining was an integral part of the history of this part of the state, and the railroads made commerce in lead, zinc and other SE KS minerals practical. 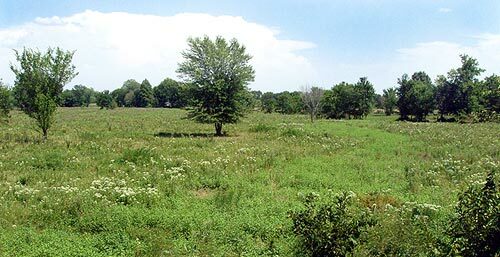 Agriculture is now the area's main industry. Corn production in Kansas has more than doubled in the last few years, and last year the state was 7th in corn production in the US. I shot a 14.5 MB movie at about this location...lots of wind noise and very little engine, but you get a bit of the flavor of the trip and can hear the whistles. 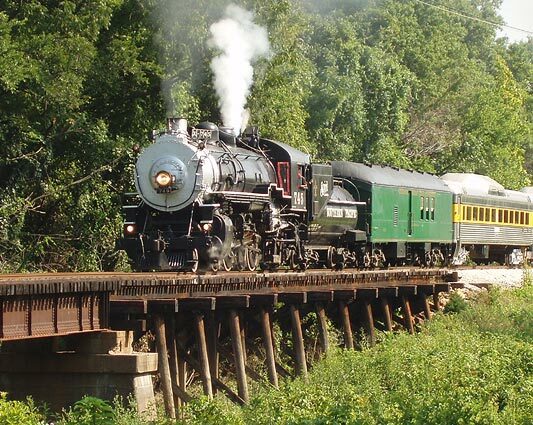 The train approaches a small trestle over Brush Creek, east of Cherokee and north of Weir, just north of Highway 400. 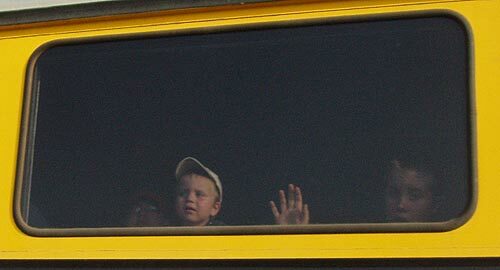 I wondered how many of these kids had ever ridden any sort of train. 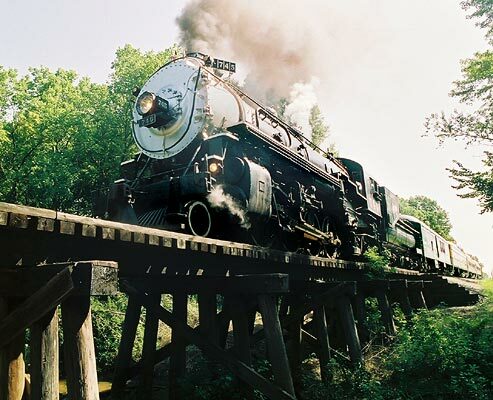 The trestle was my favorite location. Shooting from beneath was fun. 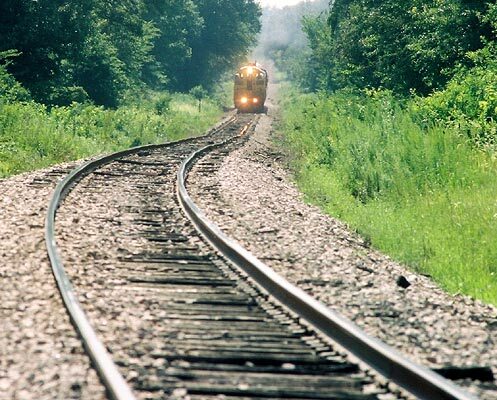 See how the locomotive is picking up some green color from the trees? 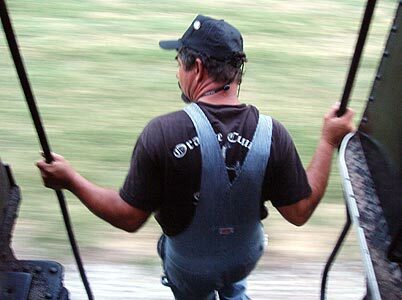 Richard Jacobs, Louisiana Steam Association member and 745 crewman, waves from the generator car. You can tell the locomotive is on a slight grade because it's working harder, hence, the smoke. 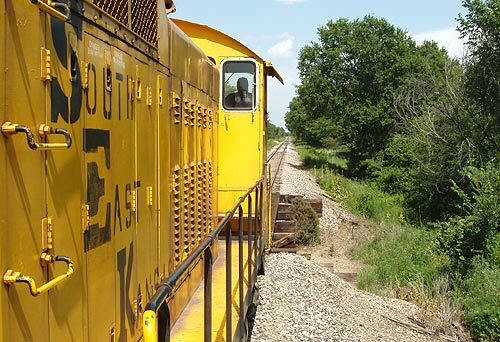 The train stopped just east of Cherokee Kansas. The area is pockmarked with these water-filled "strip pits" - the legacy of strip mining for coal. 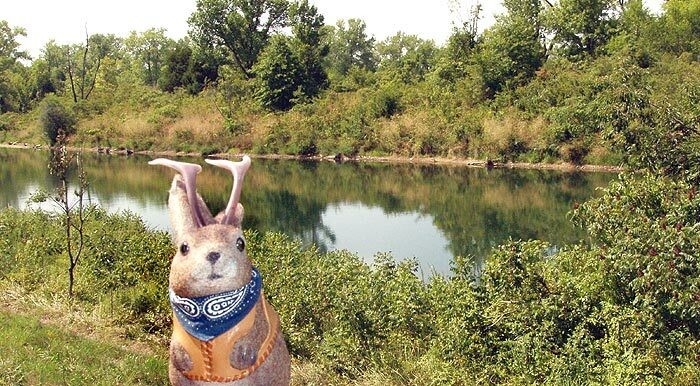 They are popular among locals for swimming and even scuba, but they are to be treated with extreme caution due to steep drop-offs into dozens of feet of water. After stopping, we backed up all the way to Pittsburg. This shot would have been better in the morning, but I included it to show the overall length of the train and the arrangement of motive power. The yellow diesel switcher is doing the work at this point. 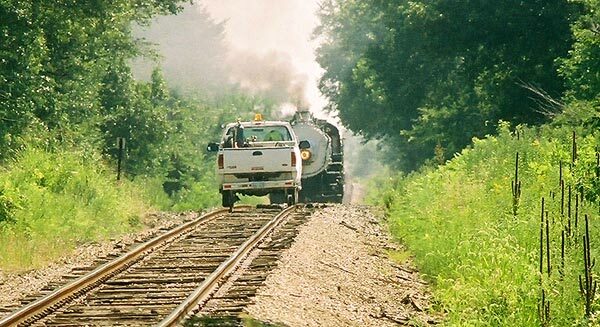 The switcher, "Bubba" is named for the grandchild of the owner of Watco, the railroad company that owns this track and loaned the passenger cars. 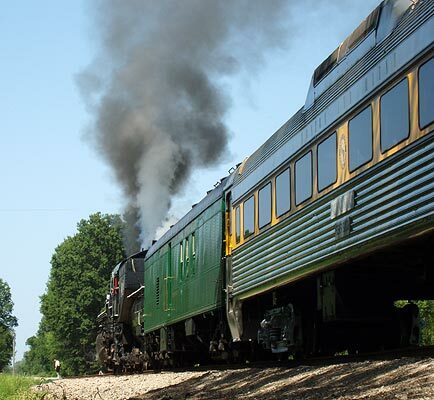 You can tell the train is being towed backwards because the smoke from 745 is trailing forward of the engine. Being nearly under something that big and loud is an experience. Forewards or backwards - I don't think it mattered to some people. A rail car followed 745 after one of its early runs to make sure the track was holding up well. 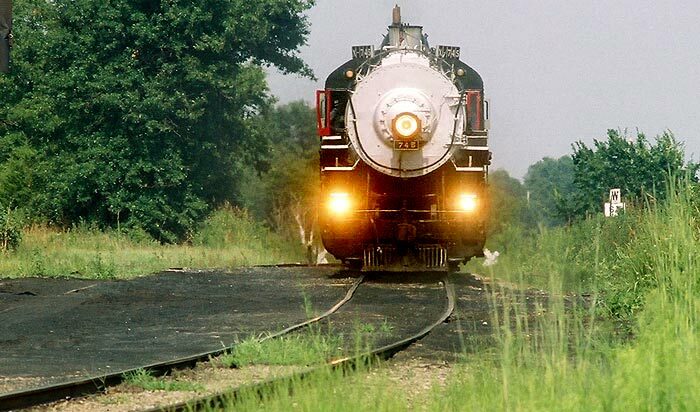 The excursion took place on ex-Frisco track (more recently ex-BNSF) which is currently owned by Watco. It's not exactly mainline track, but it'll do. This is south Broadway in Pittsburg; 745 is being hauled back to the starting point. 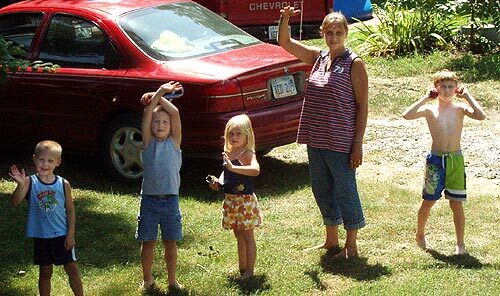 The guy in the red truck had just stepped out to take a picture. 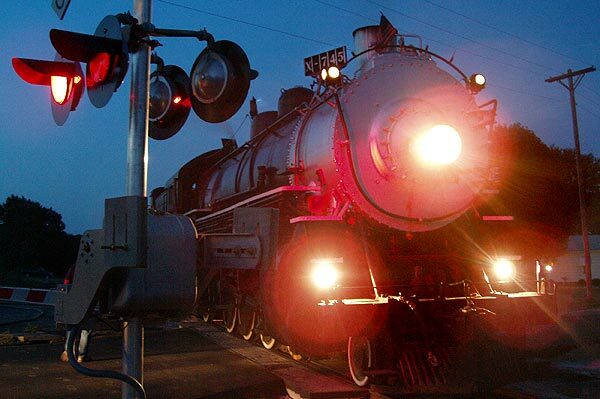 When the locomotive was stationary, it was a popular background. 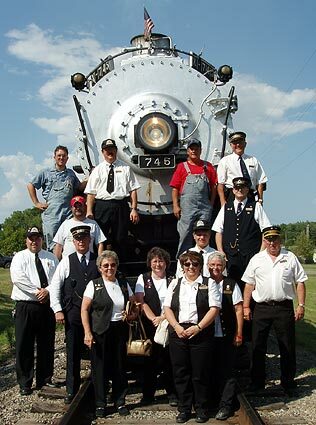 Here, members of the Heart of the Heartlands Railroad Club pose for a picture. I think Ace needs a uniform like this. 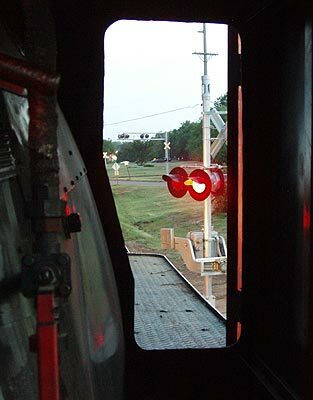 Saturday night, I was treated to a brief cab ride as the locomotive backed up a few blocks to a place where the fire department could pour water into the tender. Chief Mechanical Officer, Gerry Lynch, was acting as fireman. 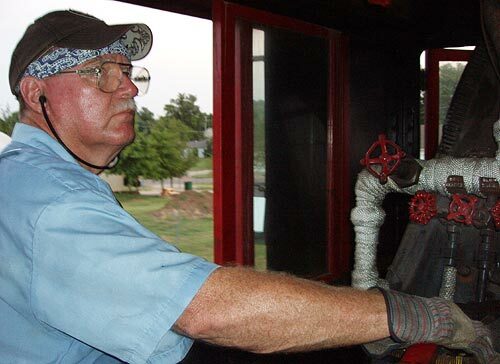 Engineer David Bartee works the throttle. Notice the water - H2O was definitely the hot commodity this past weekend. Yes, it was hot that weekend. "how hot was it?" you ask in your best Ed McMahon voice. It was so hot that when the tender overflowed with water after being filled, I was tempted to jump under it for a shower. Richard Jacobs watches the overall scene as the train backs up. 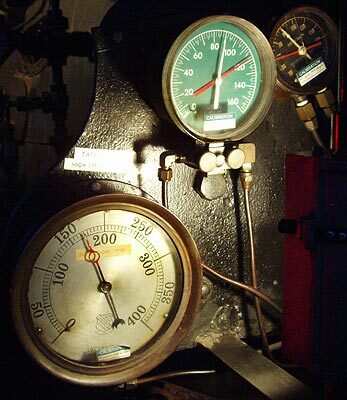 The cab ride offered me another look at the machine's instrumentation. 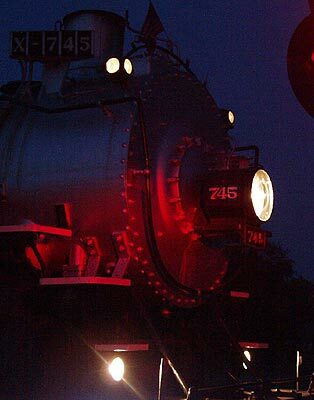 The locomotive blocked a crossing for a few minutes, which afforded me the red lighting from the crossing signals. The moon was a nice touch. This is why you should always carry a tripod. The lights in the number board were not working. However, these guys don't seem to let anything go sub-par for long; someone fixed them. Crewmen proceed with the nightly shut-down. In a few minutes, the lights will be turned off and the Spirit of Louisiana will sleep in the moonlight. 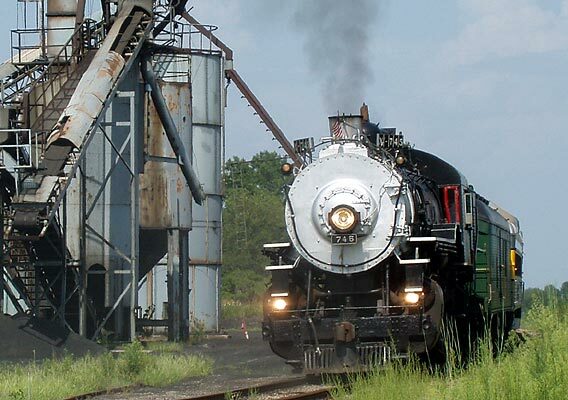 To keep up on 745's travels, check the Louisiana Steam Association's website. 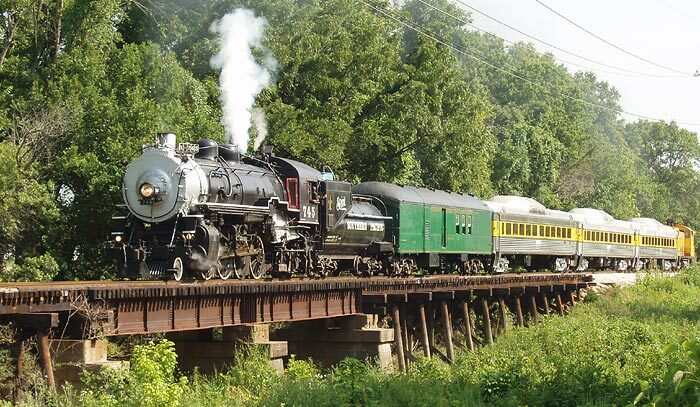 To ride even longer trains in the Pittsburg area, check the Heart of the Heartlands Railroad Club site for their schedule. 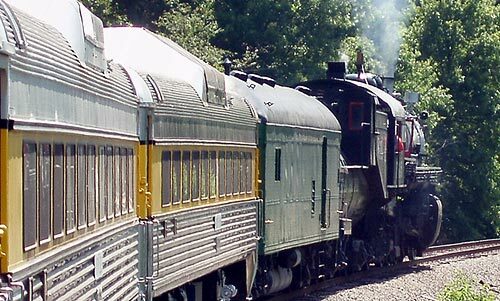 They are running several more trains this year. 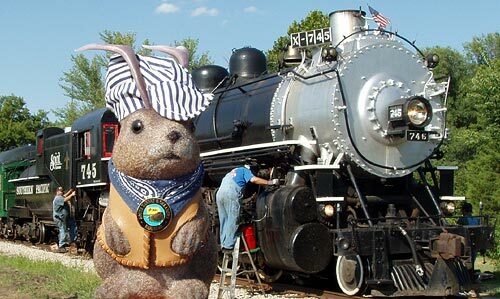 They won't have steam engines, but they're a good value, nonetheless, and they have a museum, too.